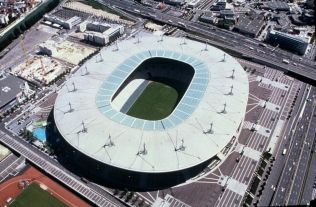 Designed by 4 architects, Michel Macary, Aymeric Zubléna, Michel Regembla et Claude Costantini, the Stade de France is considered to be the stadium of the third millennium. It boasts 80,000 sheltered seating and is equipped with exceptional facilities: restaurants open for lunch everyday of the week, reception areas, conference and exhibition space, VIP boxes with private terrace, gourmet restaurant… Football (Euro 2016, French cup, French league cup...), rugby, opera, shows, motor sports, concerts… the diversity and quality of the events organised at the Stade de France goes without saying. It is interesting to note that due to its technology, its attractive design and practical aspect, the stadium opens its doors (outside of event days) to both lovers of architecture and sport. A unique experience: "In the heart of the stadium"
Interactive events are proposed in and around the stadium thus transforming the site into a real leisure land accessible to all. Every summer, the mythical pitch of the Stade de France is turned into a beach and in wintertime, a winter ski resort. In 2023, the Stade de France will host the Rugby World Cup with eight other stadiums in France. 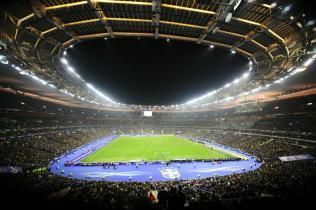 In 2024, the Paris Olympic Games will be held at the stadium as well. And if you are looking for an event in the following months, check out the Six Nations Tournament matches which will take place at the beginning of 2019. From Wednesday to Friday: 11 a.m.
Saturday & Sunday: 11 a.m. or 4 p.m.
From Tuesday to Sunday: 11 a.m., 2 p.m. or 4 p.m.
Thursday & Sunday: 2 p.m.
From Tuesday to Sunday: 2 p.m. The stadium is open on public holidays such as May 1st (if no events).